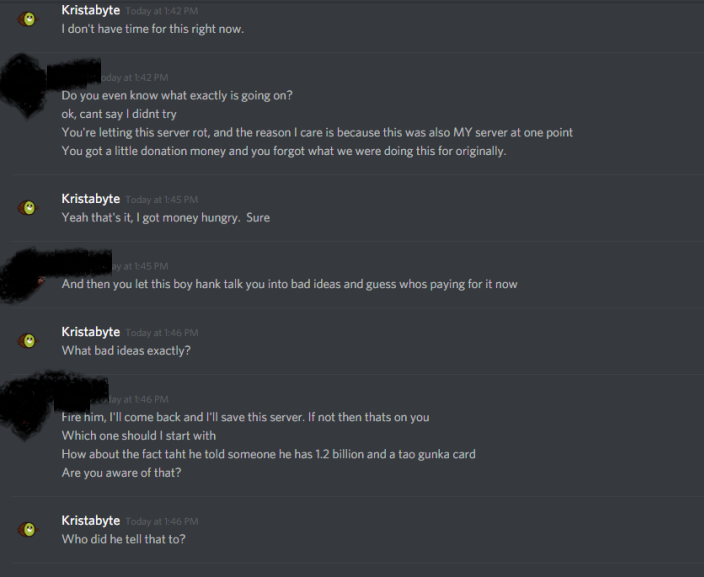 Admin has been using donations instead of paying co staff members, finding better coders, etc. Started in November, tried nicely to shift the view of the admin but it was apparent that it wasn't going to stop. Huh no server name or any other information? We are not the RO police but you are free to share the story in this forum to warn others. Edit: since you did not mention the server name and then made a review topic of the server (which fail to be an in-depth review), I'll have to merge your two posts to make the story complete. I thought it was pretty well-known that most admins aren't going to put donations 100% towards the server. Server costs vary, but servers can be run for next to nothing. In many cases, all it takes is a handful of donations to cover server expenses and everything else is pocketed by the staff. Besides, shouldn't the admin be compensated at least a little? I know from past experience that being an admin/dev can be very time consuming at times. This will vary on server size, but let's look at a case where donations are 5x what the server costs to run. Admin puts in 20 hours of work per week on average for the server. Server nets in $500ish a month in donations. Surplus of $400 that admin pockets for the month. Again, donation amounts and work put in vary quite a bit, but even in the case above where the donations are 5x what the costs are, the admin is still "getting paid" less than minimum wage in most countries. Not completely unreasonable imo. Anyway, in your case the admin isn't just buying a TV or paying rent with the donation money, he's donating it to charity. Why would you get worked up about someone donating extra money to charity? Essence RO V2, had a good start but failed to finish half way though. Community is amazing, lots of kind people, went downhill fast when screenshots were released from behind the scenes of the GMs talk of money, in game zeny abuses, -10 points on the GM communication on the server, most of the times the GMs don't know when a new update would happen or what it does because the admin is the only one that codes them. Active weekly maint, poorly coded daily events, lack of a PvP on the server made few players leave, WoE is active but only with the last 2 major guilds on the server. Economy is bad, just donation credits being sold, everyone on the server is already rich to buy everything since they had everything in the beginning. Fun and all but in the end, the server might not last long, 3/10 score. The server is Essence RO. 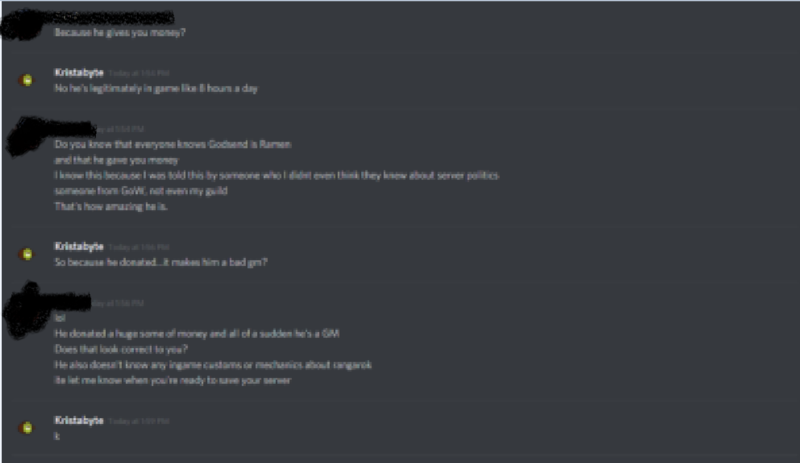 A bit of context for you since I don't write about GMs making money off well deserved servers; this was when the beginning of the server had started around November, the server was rushed into opening by the admin wanting to open the server when the beta testers told her no, the server wasn't ready but it still opened, MAJOR massive bugs in the first 2 weeks, not enough helping hands, Admin Kiwi is the only person who implements all the coding into the server because she doesn't trust the other admins to do it however the other admins do help the coding, she just reviews it and implements it. Players from the old eRO V1 started pouring money into the server thinking it would help balance the server quickly before everything ends up in flames and that would assist the staff members of the server to put a little money in their pockets to keep up the good work however Kiwi took the money instead, bought her furniture and donated 50% of earnings to charity, which isn't a BAD thing HOWEVER, I would like to point out if she wants to keep the income coming, it's best to keep a solid base of players before donating to personal agendas. One player had donated a ridiculous sum of money, so much money in fact that Kiwi later turned him into a Game Master known as Godsend. Looking at the discussion is hard but here is the chat dialogue. "Because he gives you money?" Kiwi: "No he's legitimately in game like 8 hours a day"
That's how amazing he is." Kiwi: "So because he donated...it makes him a bad GM?" Does that even look correct to you? 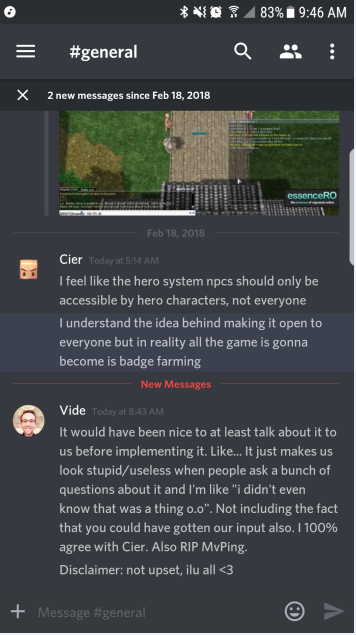 ite let me know when you're ready to save your server"
It's not even the money, in fact it's about the communication towards players of what there is to be expected from an admin but not receiving any communication at all, even the staff questions their own admin. I assume that this Kristin person would be the person responsible for the donation or the server owner. I definitely agree with the admin/s getting compensated, but to see in the first screen that "Kristin" was to take half of the donated money away from the server really puts me off. I think the server should get the first priority from the donation money. If I want my money to be donated to a charity, I'd do it myself. If I want to pay to ensure next month I would still have a server to play on, then I want my money to be put to help run the server. In saying so was there any evidence of money being put wisely? Was the server running stable and smoothly? Was there alot of downtime? Did the server went through an upgrade etc? And I also think there should be some sort of consensus agreed in decision making amongst server gms and owner in this regard.